Buddha Mommy » Could you “bear” to be without yoga for another week? This entry was posted on Thursday, September 9th, 2010 at 3:39 pm and is filed under Sarayu Yoga. You can follow any responses to this entry through the RSS 2.0 feed. You can leave a response, or trackback from your own site. Could you “bear” to be without yoga for another week? 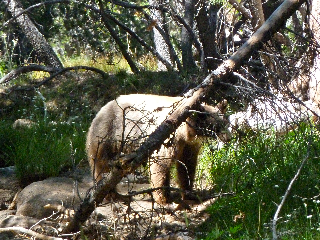 Here’s a yoga friend we met along the trail this past weekend. She really knew how to do bear rolls! Hope you can find the time to care for yourself on Monday, September 13 from 6:30-8:00 pm at the UU Church of Fresno in Clovis.